The unique story of USS Solace, the famed Hospital Ship of Pearl Harbour attack of 1941 has been circulating on the internet for some time now. The story was apparently first told by the modern Turkish “storyteller” Sunay Akin. Among other things Sunay Akin is poet a TV personality and a showman who has a Paul Harvey type style when telling stories. Just like in the “Rest of the Story” his anecdotes have a unique twist at the end, there are no sources cited but the listener presumed to follow. Lately, I have been on the receiving end of the the story over the internet with increasing frequency. Finally, I got tired of reading the fable and decided to research and rewrite the whole story. To my surprise, although the ending of the story was true, there was a lot more to add to the beginning to make the USS Solace story complete. It all had started with the construction of SS Iroquois by the Newport News Shipbuilding and Drydock Co., Newport News, Virginia in 1927. Yesterday the head of the German Navy, Grand Admiral Raeder, officially informed the American Government, through the United States Naval Attachй in Berlin, that according to information on which he relied, an American ship, the Iroquois, is to be sunk when it nears our American east coast. The sinking of the Iroquois, Admiral Raeder said, would be accomplished through a repetition of circumstances which marked the loss of the steamship Athenia. The S.S. Iroquois, formerly in our coastwise trade, was chartered by the Maritime Commission recently to go to Ireland to bring back Americans who had been caught in Europe at the outbreak of the war. The Iroquois sailed from Ireland on October second with a full list of American passengers. This was the chief tenor of the official note sent to us by the head of the German Navy. As a purely precautionary measure, a Coast Guard vessel and several Navy ships from the patrol will meet the Iroquois at sea and will accompany her to an American port. Furthermore, the Captain of the Iroquois has been informed of this official note from the German Admiralty and has been asked to make careful search for any possible explosives on board his ship. The whole of this information has also been conveyed to the British and French Admiralties. **Citation: Franklin D. Roosevelt:"Statement on the Threatened Sinking of the S.S. "Iroquois. "," October 5, 1939.Online by Gerhard Peters and John T. Woolley,The American Presidency Project. http://www.presidency.ucsb.edu/ws/?pid=15819. USS Solace (AH-5) at anchor in Pearl Harbor, 6 December 1941 Photo and text from "Hospital Ships of World War II: An Illustrated Reference" by Emory A. 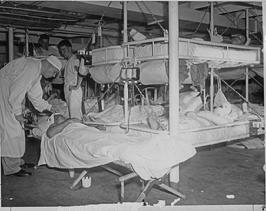 Burned and injured patients receive care aboard USS Solace (AH-5)following the Pearl Harbor attack on 7 December 1941. 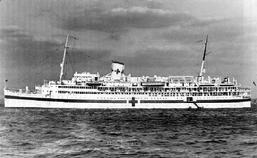 Two weeks after her conversion to a Hospital ship, USS Solace (AH-5) was commissioned under Capt. Benjamin Perlman’s command and was assigned to the Asiatic-Pacific Theater. Solace was stationed at Pearl Harbour during the attack of 7, 1941. 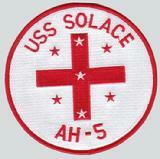 When the first bombs from the Japanese planes hit US battleships the crew of Solace was immediately called to duty. It was as if hell broke loose, with flames rising to the sky from the battle ships and sailors jumping into the burning sea. Motorboats with stretchers were immediately sent to the burning battleships of Arizona and West Virginia. The crew of Solace started pulling wounded from the ships as well as from the burning sea. After helping those two battleships, this time Solace started sending boats to USS Oklahoma to try to rescue injured Navy men. The USS Oklahoma had started capsizing, trapping some of the crew inside the hull. Solace’s damage control officer and several shipfitters spent 36 hours in the capsized hull of the battleship and rescued 32 men. Most of the dead sailors were burnt beyond recognition. Following is a direct quote from Navy Veteran named Ralph Laedtke, a pharmacist technician on USS Solace during the Pearl Harbor attack, who was assigned to keep records of the injured and death. “Late in the afternoon, I was sent to the morgue. I had to prepare death certificates,” The process included taking fingerprints to help identify victims who weren’t wearing ID tags. After the brave service during the war, USS Solace was decommissioned on March 27, 1946, at Norfolk, VA. and transferred to the Maritime Commission for disposal on July 18, 1946. She was helplessly waiting her scraping day when she got the news for a third life. 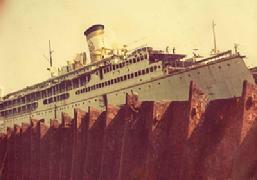 On April 16, 1948 the Turkish Maritime Lines purchased the SS Solace and once again transformed it to a passenger liner. She was now to be called SS Ankara. 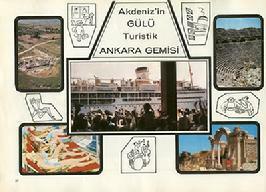 After Turkish Maritime lines purchased the ship and brought it to Istanbul they renamed her Ankara. 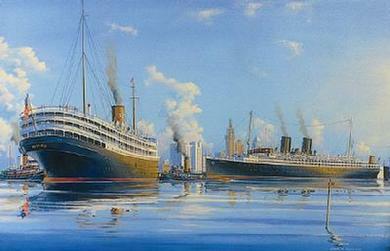 She was transformed to a luxury liner with 25 Luxury, 89 First Class, 40 Second Class and 5 Tourist Class cabins. 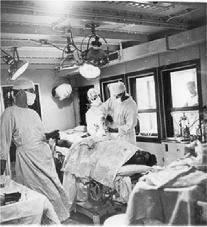 There were two dining halls on the ship, one smoking hall with a large bar, a swimming pool, a medical and surgery room. 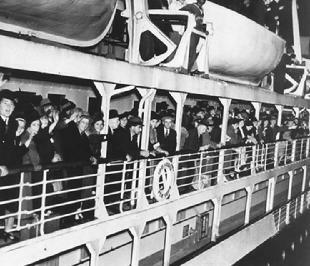 Also the ship was equipped as a ferry boat to carry passenger cars when needed. She became immediately known as “ the crown jewel” of the Turkish Maritime Lines and and was nicknamed “Akdenizin Gülü/The Mediterranean Rose”. She sailed in the Mediterranean for several years under Captain Şefik Göğen whose name became synonymous with the ship until he retired in 1961. The quality of her service, her promptness on arrivals at ports, the gourmet food in the restaurants prepared by famous chefs, fashion shows and concerts by well known models and musicians given aboard, set SS Ankara apart from others and gained her an almost legendary reputation among the Luxury Liners. She was the “love boat” of her times. It was October 1977 when SS Ankara’s long life on the ocean was going to come to an end. She sailed with her own power one last time to the docks of Golden Horn in Istanbul. There a few months later they cut and dismantled all of her belongings from the deck. A year later in 1979 she was towed with a help of a tugboat to Aliaga, Izmir on the Aegean Coast. Iroquois the Luxury Liner and the Refugee Ship, Solace of Pearl Harbor and the Pacific, Ankara the Rose of Mediterranean, whichever you prefer to call her, was to lay there at the Kılç Cove in death bed for two years. Finally on May 1981 several welders cut and scraped remaining parts of her body. All of the led taken from the walls of the once " x- ray room" was separated from the rest of the scrap. It was going to be shipped back to Istanbul to the same docs at the Golden Horn where SS Ankara was towed from. Kasımpaşa is the name of an area by the sea shore of Golden Horn in Istanbul. A Marine town from the beginning and since centuries, she is known for hosting the first Turkish Naval Academy, “Kasımpaşa Deniz Mühendishanesi”, the first modern shipyard, Taşkızak and the Naval Ministry Building, “Kuzey Deniz Saha Komutanlığı” . 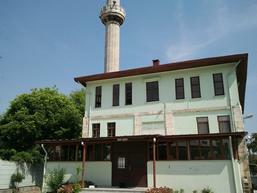 Within the territory of the ship yard there is a tiny mosque called Sadrazam Çorlulu Ali Paşa Camii or Grand Vizier Ali Pasha of Çorlu Mosque. 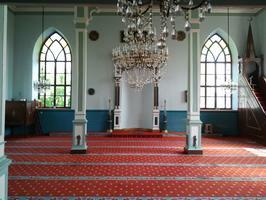 The Mosque was built in 1706 , remodeled in the 19. Century and reconstructed during the era of Sultan Abdülhamit at the beginning of the 20. Century after an earthquake. There is nothing special about the tiny mosque which has one minarette, one dome and one water fountain the so called “Şadırvan”. 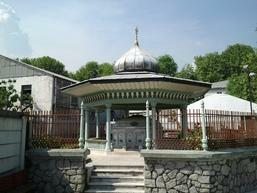 The mosque is frequented by the local people, sailors, dock workers and usually people who work in or near the shipyard. 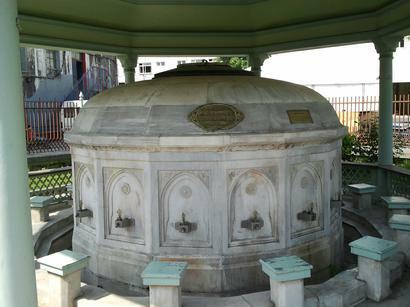 Water is sacred thing according to Islamic belief and is cherished and put to public use in the form of water fountains or “çeşme”s and şadırvans in the courtyards of mosques. Where the water is usually used for drinking at a çeşme the water from a şadırvan is used to wash hands, arms, face and feet before the prayer. Situated in the middle of the courtyard it is usually in the form of a heptagon or octagon with faucets on each marble wall and low stool in front of the faucet to be used in washing oneself before the prayer. The water reservoir in the middle is usually decorated with a sprinkler in a water basin. The şadırvan has a roof on top in the form of a dome and usually covered with led for longevity and uniform look. While SS Ankara in Izmir was being scrapped in May of 1981, the little mosque at the Taşkızak Shipyard by the Golden Horn was going through a major renovation. Along with the mosque all of the plumbing of the şadırvan was being replaced and new faucets were being installed. But the major replacement was going to be the century old leaking roof. And where else could they get recycled, inexpensive led; but from an old ship who was once a guest at their shipyard? One telephone call to Izmir solved the problem easily. 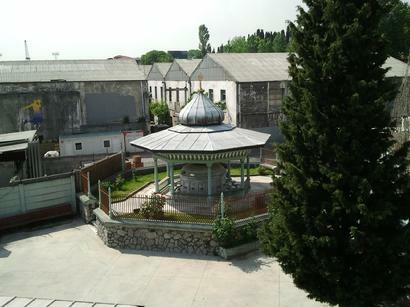 A week later led tablets from the x-ray room of SS Solace were delivered to the mosque in Taşkızak and within days installed on the iron frame of the roof of the şadırvan. SS Iroquois had saved the lives of refugees, SS Solace saved lives of thousands of soldiers and SS Ankara had served and entertained people. At a given point in time on each occasion, sailing on water, people prayed to the Creator to reunite themselves with their families, for peace and for the well being of their loved ones. Now the last surviving piece of that one ship, the led from her x-ray room, is giving shelter to people who are washing themselves with water and who are preparing for the very same prayers.